Can we talk birthday cakes? Choosing what cakes to bake for Kurt’s birthday and my birthday is a lot of fun, and this year, the two cakes kind of worked together. I went with classics this year. For Kurt’s birthday in February, I made a Boston Cream Pie from the Baked Explorations book. It was filled with both vanilla and chocolate pastry cream and required seven egg yolks. At that point, I already started planning ahead for my birthday which was last week. I saved the seven egg whites, whisked them together in a small container, and stashed them in the freezer. I knew they’d come in handy for making my angel food cake. As my birthday approached, I just had to decide exactly which kind of angel food cake to make. There’s a Black and White Angel Food Cake in Barefoot Contessa at Home that’s made with chocolate chips and topped with a chocolate ganache. I want to try that one someday, but it wasn’t what I wanted for my birthday. 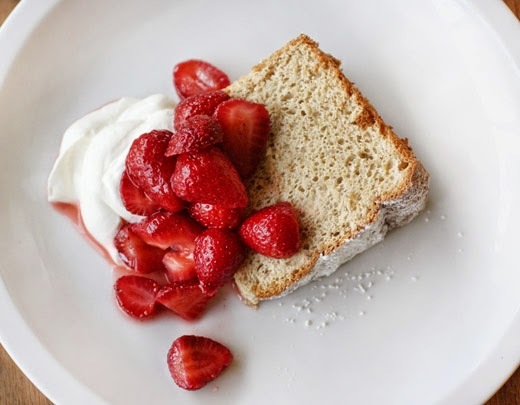 In the book Flour by Joanne Chang, there’s a Toasted Coconut Angel Food Cake that became a serious contender. In Ruhlman’s Twenty, he shows a classic angel food cake covered in whipped cream and topped with chopped homemade toffee and shards of chocolate. I always veer toward toffee, so that one had my attention. 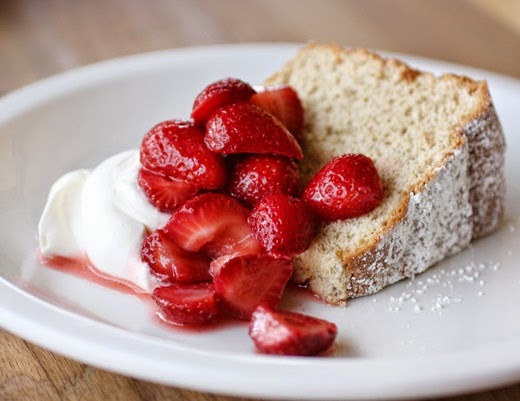 But, I had visions of fresh, local strawberries on the plate with each piece of cake. For a moment, I thought maybe I should stick to a lemony angel food which is one of my favorite cakes. No, wait, hold everything, I thought I remembered from years ago on an early version of the Martha Stewart show, she made a Brown Sugar Angel Food Cake. I’d never made one or tasted one before. That needed to be my birthday cake this year. The recipe I used is found in The Martha Stewart Cookbook , and that version is cut and layered with whipped cream and blackberries. The same recipe for the cake itself is also online where it’s served with candied citrus. I did neither of those things because strawberries simply had to be involved. The most difficult thing about this cake is sifting the brown sugar. I don’t know if my sifter is too fine or if my brown sugar was particularly coarse, but it took a bit of work to get it all sifted. The cake flour needs to be sifted as well, but that was much simpler. Half of the sifted brown sugar was then combined with the cake flour, and that mixture was sifted together twice. Next, fourteen egg whites were needed, and I was glad to have seven ready and waiting that I had pulled from the freezer and thawed. To bring the egg whites to room temperature, I set the mixing bowl into a larger bowl of hot water and stirred the egg whites around until they warmed up some. The room temperature egg whites were whisked using a stand mixer until foamy, and then cream of tartar was added. The mixer speed was increased, and the egg whites were whisked until very thick. Half of the sugar was added, and the whisking continued. The remaining sugar was added and whisked until the egg whites were stiff. The flour and sugar mixture was folded in in three additions. Lemon zest was to be added with the last addition of the flour mixture, and I worked the zest into the flour to be sure there were no clumps before adding. The batter was spooned into a tube pan and baked for about 45 minutes. I hulled and chopped strawberries and sprinkled them with vanilla sugar to get the juices running. The cake was served with whipped cream and those sweet, juicy berries. The light, airy texture of this cake is the same as any other angel food, but the crumb has a delightfully honey-like color. The lemon flavor is subtle here, and the brown sugar gives the cake just the slightest hint of butterscotch. It’s like a sweet angel food cake with a little something extra. It was exactly what I wanted for my birthday cake. And now, I want to try all those other versions too. Splendid and very tempting! A great springtime and summertime cake. Perfect with berries. Oh, I ADORE this post! I had no idea you could make an angel food cake with brown sugar, and now I cannot take it out of my mind! I don't think I have ever seen a recipe for Brown Sugar Angel Food Cake. I must say, it is very intriguing. 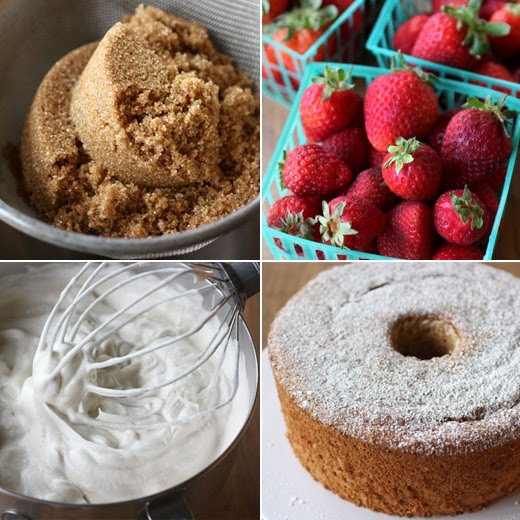 I can't even imagine trying to sift brown sugar, I have all to do to sift flour, lol...I'm sure it brought a wonderful dimension to the cake though and a wonderful depth to the strawberries. The cake looks so light and beautiful, Lisa. love the looks and idea of this cake! angel food cakes, brownies, cupcakes and all other American pastries are hot in Lebanon. Will tell my friend Anne-marie about your creation! Happy birthday! Oh my goodness! Brown sugar in an angel food cake, how fab! Martha's recipes always seem to leave out one critical step or hint but it didn't derail this wonderful spring cake! I would love this light fluffy cake to enjoy - richer and more indulgent! The cake looks amazing, but sifting brown sugar does sound really difficult too. Still, yours looks just about perfect. Happy Birthday! When I was a kid, for some reason I always wanted a cake "as big as my head" so my mother made angel food. Still one of my favorite cakes! This is terrific -- thanks. Happy Belated Birthday Lisa! The cake looks delicious with brown sugar...and such a nice crumb...I like that you served with fresh fruit. Happy birthday, Lisa! Looks like you were well rewarded by all that sifting effort here. Happy belated birthday! This cake sounds lovely...I bet brown sugar is divine in angel food cake. Never heard of brown sugar angel food cake! How interesting this is! But it looks incredible, especially with those ripe strawberries. By the way, I didn't know you can freeze egg whites. I usually save them for just a few days. If they didn't get used, they would go straight to trash. How do you do it exactly? Just put in a container and freeze? Thanks, Lisa. For whites, I whisk them together just a tiny bit and place in a container and freeze. For yolks, I add a few drops of water, whisk them a little, place in container and freeze. That's amazing, Lisa! I have the recipe on my counter, ready to make. Saw Martha Stewart make it a while back and thought it looked marvelous. And so it does. That cake slice looks so good - I love your photos, Lisa! They always make me drool.